Standing at the edge of the ocean between Zuma State Beach and Broad Beach, the Malibu West Beach Club occupies one of the most desirable chunks of real estate in Southern California. Glorious white sand stretches to the breaking surf, and from the facility’s deck, there’s a 180-degree panorama of the vast Pacific and miles of Malibu coastline. When it’s clear, you can see Catalina Island and the Channel Islands, and almost daily you’ll spot dolphins leaping out of the water as they swim by. 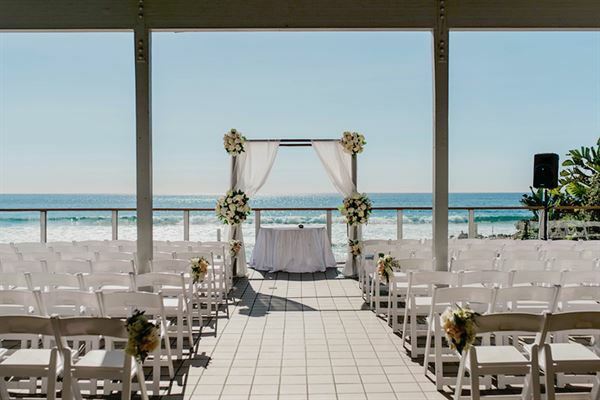 Ceremonies take place on the partially covered deck over looking the coast. Guests are seated facing the ocean on the tiled 50-foot-wide deck, while bride and groom can tie the knot under a rented flower-covered arch, canopy or chuppah. Afterwards, the newlyweds and attendants are invited to go down to the beach for wedding photos. All the elements are there for fabulous pictures: sun, sand, ocean—there’s even a Baywatch-style lifeguard tower on which everyone can pose for a group shot. Dinner and dancing are indoor activities, while sipping champagne, sampling hors d’oeuvres and lingering over a setting sun all take place on the deck. From your oceanfront perch, you’ll feel the cool breezes and taste the tang of sea salt in the air. At night, you can look up and see millions of stars being born. $1,000.00 Damage Deposit required for all events due 60 days before event. Rental period Up to 12 hour rental period. Includes upstairs clubhouse with views of the Malibu coastline: banquet area, deck, gourmet kitchen and private bride’s suite. Security, Tables/Chairs, and required cleaning. You also get 7 parking spots at front of beach club. Additional Hours beyond 12 hours may be added for $100.00/hour Set-up of Tables & Chairs $100.00 and/or Breakdown of Tables & Chairs $100.00 50% non-refundable deposit required to reserve date, balance due 60 days prior to event. *** Guest counts of 171-250 are too large for wedding events requiring a dance floor. Special Features: One of a kind.